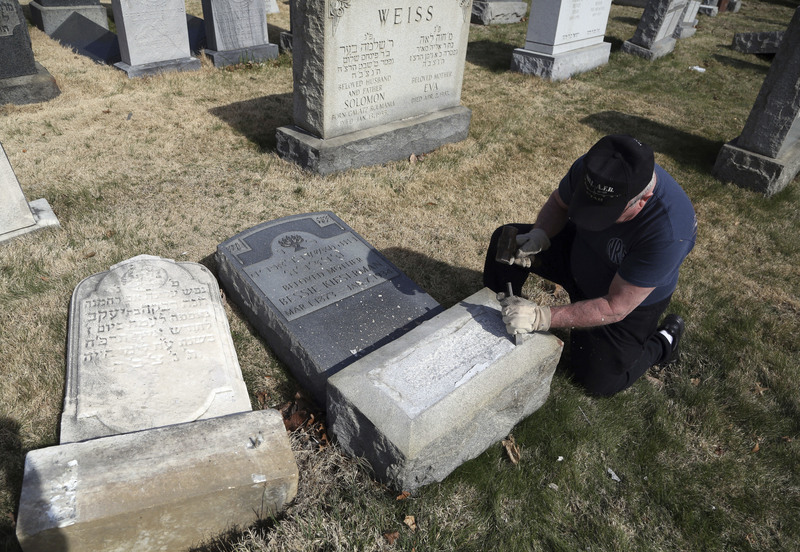 PHILADELPHIA (AP) — Dozens of volunteers from various faiths helped clean up a Jewish cemetery on Tuesday after scores of tombstones were toppled by vandals, as people from as far as Boston came to Philadelphia to rake leaves, help document the damage and pray for peace. Police have not determined who was behind the vandalism at Mount Carmel Cemetery, which was reported over the weekend, or the motive. The Anti-Defamation League offered a $10,000 reward for information leading to an arrest and the Fraternal Order of Police $3,000. The desecration of more than 100 graves in the crowded cemetery came as Jewish Community Centers and day schools around the nation deal with wave after wave of hoax bomb threats. A Jewish cemetery in suburban St. Louis has also been targeted. Some volunteers raked leaves into bags, while others carried clipboards and began the process of mapping the hundreds of tombstones in the crowded cemetery, noting any damage to each. One man whose son will be commissioned as an Air Force officer in May became choked up as he uncovered the flat tombstone of a World War I veteran, which had been obscured by years of dirt and debris. Another volunteer, Robert Weiss, 55, of Dover, Massachusetts, took a day off from work and drove more than five hours to Philadelphia to lend a hand. “I just had to see this for myself, and participate,” said Weiss, adding he was “beside himself” when he saw the damage. After each one-hour shift, the volunteers walked to a corner of the cemetery, where a rabbi offered a meditation and led them in song — a Jewish prayer for peace. Sarah Samuels, a University of Pennsylvania student, said she was gratified by the response. “But this shouldn’t have to have happened in the first place,” she said. Jewish leaders said they’re not sure whether the vandals were motivated by anti-Semitism or simple maliciousness. Judging by the path of the damage, it appears the vandals might have accessed the cemetery from an adjoining playground through a piece of damaged fence. Bill Doran, the superintendent of another cemetery in Philadelphia, told The Philadelphia Inquirer he visited Mount Carmel on Feb. 21 and noticed the damage then but didn’t report it, assuming the managers were already aware. Police first learned of the damage on Sunday.